Now that production on ABC’s Inhumans—the latest series set in the Marvel Cinematic Universe—is underway, it was only a matter of time before we got a look at just how faithful it was going to be to the look of the characters from the comics. Of course, much like the shifting of the Inhuman home base from the moon to Hawaii, it’s expected there will be some changes to the aesthetic in the move from page to screen. What we weren’t expecting, on the other hand, was an initial look at the cast in character that made them resemble the third-place finishers in a local cosplay competition. Entertainment Weekly has a first look at the heroes in the upcoming eight-episode series, and the results are a little disappointing. Really, it’s Medusa’s hair that has us most concerned. It was always unclear what the Inhuman’s hair would look like when it wasn’t in action via what will have to be CGI. (For those unfamiliar with the character, the Inhuman queen, played by Serinda Swan, has a power we’ve summarized as “super hair,” meaning she can move it in the same way the average person can move arms and legs.) Right now, it resembles an especially unconvincing wig, though at least her outfit has a splashy color. Part of the fun of the Inhumans is that it’s a chance for Marvel to engage in the kind of outlandish imagery movies like Guardians Of The Galaxy and Doctor Strange have embraced. And while nobody expects blockbuster-level effects on a TV budget, surely the costume department can come up with something that doesn’t look cobbled together from last weekend’s Ren Faire. Also, we’re still waiting to see Lockjaw, everybody’s favorite giant teleporting dog. Perhaps he teleported into a more appealing wardrobe? 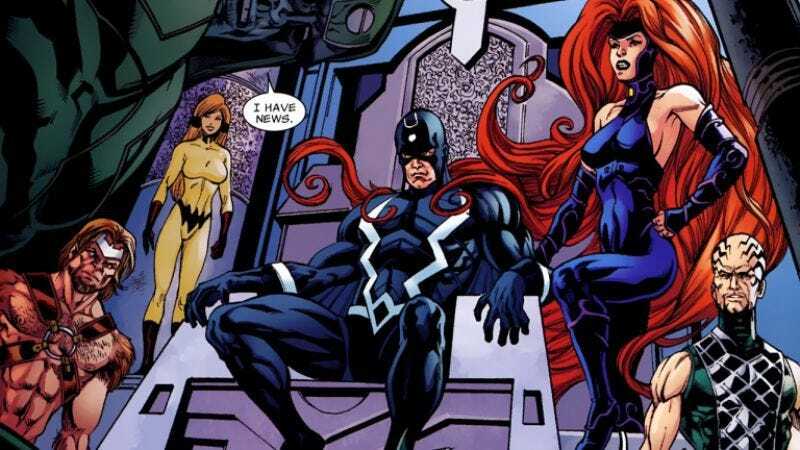 Let’s hope the show is still refining these looks before shooting; it would be a drag if it took Inhumans an entire season to get things right, the way it did a certain other Marvel show featuring Inhumans.